Corel, the makers of WordPerfect® Office, a trusted and essential tool in the legal community, today unveiled Corel® Perfect Authority, a new program for the legal market that automates the citation process. CorelPerfect Authority generates Table of Authorities in a few easy steps, saving legal firms time and money by reducing the effort needed to create the list of citations required in legal briefs. Corel will be demonstrating Perfect Authority for the first time today at LegalTech at booth #532. Hand-marking each citation for a Table of Authorities can take hours - especially for firms managing multiple cases that all require legal briefs. Using the The Bluebook® and the California Style Manual as authorities, Corel Perfect Authority is an essential application that quickly locates, alphabetizes and cross-references citations in a document to create a highly accurate Table of Authorities. Corel Perfect Authority works with Corel WordPerfect ® Office X5 allowing law firms, paralegals, corporate legal departments and government agencies to reduce the amount of time spent manually creating Table of Authorities. Powered by the legendary formatting features of WordPerfect, Corel Perfect Authority enables users to create a variety of customizations, helping legal entities meet the citation formatting requirements of different districts or courts. In addition, users can take advantage of the trusted features and enhancements offered in WordPerfect X5, including superior PDF capabilities that make it easy to import, edit and export PDF documents. "For many years, Corel and the WordPerfect brand have been trusted partners in the legal market. Working closely with members of our legal community, our product development is driven by their specific requirements and feedback. As we unveil the new Corel Perfect Authority here at LegalTech, we're growing our portfolio for the legal community with another powerful tool that's designed to help our users be as productive as possible," said Cindy Howard, Product Manager for Corel Perfect Authority. 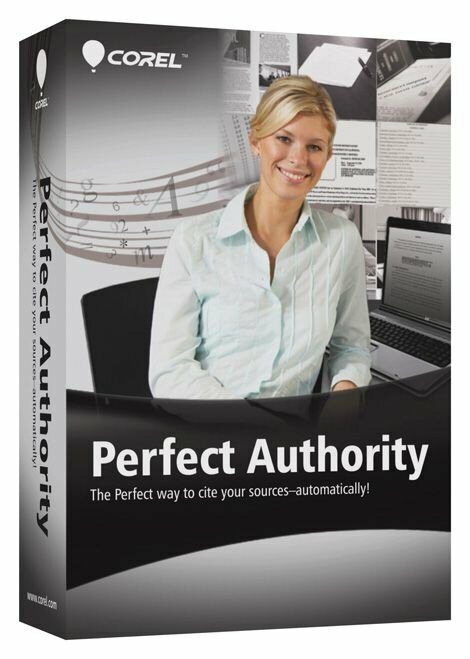 Available today, Corel Perfect Authority can be purchased as an electronic software download (ESD) for a suggested retail price (SRP) of $199.99 (USD). For a limited time, customers can purchase both WordPerfect Office X5 and Corel Perfect Authority together and save up to $40.00 (USD). To learn more about the potential savings with Corel's volume licensing options visit www.wordperfect.com. A free 30-day trial version of Corel Perfect Authority is also available at www.corel.com/perfectauthority. For additional Corel Perfect Authority resources including reviewer's materials and images, please visit www.corel.com/newsroom. To learn more about how people are using WordPerfect® Office, please visit the product's community site at http://officecommunity.com and join the Official WordPerfect fan page on Facebook. Our award winning product portfolio includes some of the world's most widely recognized and popular software brands, including CorelDRAW® Graphics Suite, Corel® Painter™, Corel DESIGNER® Technical Suite, Corel® PaintShop Photo®, Corel® VideoStudio®, Corel® WinDVD®, Corel® WordPerfect® Office, WinZip® and Corel® Digital Studio™. © 2011 Corel Corporation. All rights reserved. Corel, the Corel logo, the Corel Balloon logo, Corel DESIGNER, CorelDRAW, Digital Studio, PaintShop Photo, Painter, VideoStudio, WordPerfect, WinDVD and WinZip are trademarks or registered trademarks of Corel Corporation in the United States and other Countries.All other product names and any registered and unregistered trademarks mentioned are used for identification purposes only and remain the exclusive property of their respective owners. To view a box shot of Corel Perfect Authority, please visit the following link: http://www.marketwire.com/library/20110128-corelperfectauthority800.jpg.